As a mother of a newborn baby, one of the first few problems you will face is selecting the right cleaning products for the baby’s use. Keeping your baby clean and safe is no mean task considering that babies are at higher risk of infection than adults. By following a proper regimen of cleaning the baby’s clothes, most infections can be prevented. Your focus should be on the cloths because it is the single most deadly source of infection and also a fertile ground for bacteria to grow and transfer to the baby. Detergents play a vital role in cloth washing and most of the off-the-shelf products are generalized products that meet the needs of everyone in the family. Such detergents don’t meet babies’ needs and you may have to go in for a baby laundry detergent with the special formulation. Why a different special detergent for the newborn? It is a fact that detergents contain chemicals and a good detergent company will only use only those chemicals that don’t make a negative impact on clothes and the skin. The chance of a non-standard detergent company using harsh chemicals is a distinct possibility and likely to harm the baby’s skin though it may not necessarily affect adults. This is why a different type of baby clothes washing liquid is required for babies. We recommend baby clothes washing liquid over powders or cakes because it is possible to control the quantity that is put to use and the ease with which washing can be accomplished. Yet another benefit of using liquid is that it can be measured precisely. Should Babies Cloth be Washed Separately? Having established the need for separate baby clothes washing liquid, let’s look at other factors of washing babies clothes. One of the many questions that mothers usually ask is should we wash babies clothes separately? The answer is an affirmative yes. Normal liquid detergents, though safe are harsher on diapers and other babies’ clothes and since you may have to use a different washing liquid, we recommend that you do it separately. Washing babies’ clothes along with the adults’ cloth can potentially bring the baby’s cloth in touch with bacteria which will ultimately transfer to the baby’s body and cause sickness. You can stop this from happening if washed separately. Babies clothes are usually of a softer texture and mostly free from dyes and pigments. Compare this with adult’s clothes that are tougher and have plenty of colors and you will understand why the two shouldn’t be mixed in a single washing retinue. 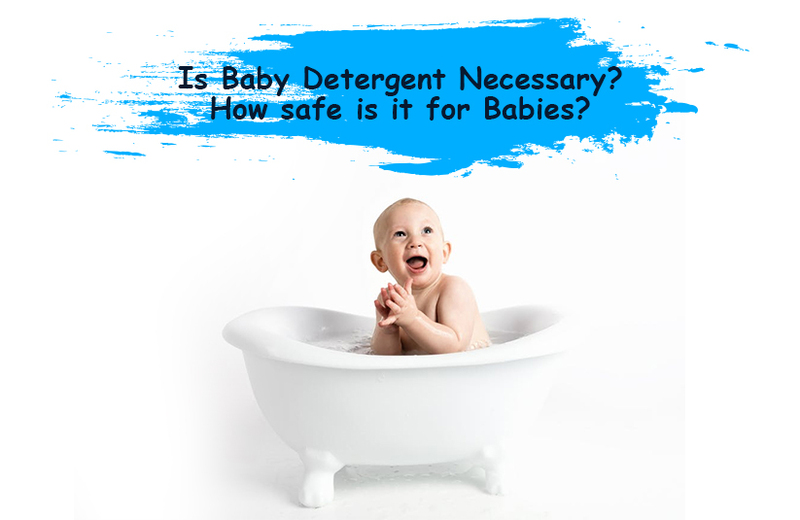 How Long to Use Baby Laundry Detergents? Baby laundry detergents are milder and have lesser quantities of harsh chemicals, but the flip side that they are not powerful enough to remove dust and grit that is normal on adult clothes. Ideally, when the baby is about one year old, you can shift to the same liquid detergents you use for the entire family. On the sidelines, we will recommend you to use a softener on babies’ cloth for a few more months. The benefit is that the fabric will be soft to touch and help to prevent skin rashes, especially in the groin areas and armpits. By the time a baby is past one year, the baby’s immune system would have developed robustly and you will also have started to use colored cloths on them. However, we recommend that you continue to wash babies’ clothes separately for six or months using a normal liquid detergent. When babies are two or more years old, you don’t have to take this trouble too. There are many liquid detergent manufacturing companies, but not all give the same level of satisfaction. There is some experimenting that you may have to do. To begin with, try a small pack and read instructions carefully.